I admit to a bit of prejudice against short short stories. Often they seem imposed by busy editors who want to introduce new writers but don’t have the time to read through a stack of 5,000 word stories. But I’d heard through the grapevine about Ethel Rohan’s work and looked up a few pieces online. She’s been in dozens of online magazines. I read Kriegsspiel first. It stuck in my head like a mind-probe. Then I read another one called Imagine. And then this slighly longer story where a family go to extraordinary lengths to show they will be a good home for a puppy. 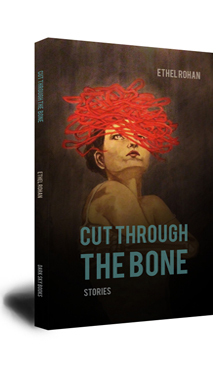 I bought her collection Cut Through The Bone. Her stories have great variety, but they will often use the surreal to probe real emotions. The scene and voices are hyper lucid, but the motives will be obscure. There are traces of Kafka – who also wrote dozens of shorter pieces. It’s hard to describe what’s so attractive about her writing. The best pieces have that quality where you feel they stand as a completed whole, not something pasted together with the aim of entertaining the reader. And you can go back at look at it from various angles, but still you will not see it through to the core. She’s one of the most interesting new writers around.